via Slow Food and Agritourism in the Pacific Northwest. One goal of agritourism—like the dinners Farm to Fork stages at farms like the Kiyokawa family’s in Oregon—is to support producers by bringing us to where food grows. There was a telescope at the Willows Inn, but I didn’t really need it. Right from the breakfast table I could see the harbor seal, blubbery and self-satisfied, floating head up for a minute or two, then diving again with a frantic slapping of the tail. The currents off Lummi Island are strong, and on a crisp blue day you can see all the way to Vancouver, British Columbia, sixty miles away. Breakfast arrived, and with it the chef, Blaine Wetzel, just twenty-seven. We’d met the night before, as he methodically prepped and plated a dinner for thirty-six, assembled almost entirely from ingredients harvested around Lummi, just off the coast of Washington State. Wetzel had been working in Copenhagen before this, the place in Europe right now for high-flying conceptual food. He insisted there was nothing Scandinavian about his eccentric tasting menus, though, which cost $150 per person and are sourced by foraging the island, combing its beaches, harvesting its water, and gardening its hills. Perhaps the conifers and the climate—misted with rain ten months out of the year, if brilliant blue today—were similar, he conceded. But the essence of the place is this place. Going local has forced Wetzel to be excruciatingly careful, to plan far ahead, cook seasonally, and tease maximum flavor from what is at hand. If the island gives you nettles, you learn to coax the greatness out of nettles. Lamb or pork is arranged with a phone call. The endless cultivation of just four acres up the hill gives him lettuce, broccoli, cauliflower, carrots, potatoes, squash blossoms, nasturtium flowers, zucchini, and herbs. He is experimenting with recycled pallets, which can be seeded with crops and propped vertically, getting even more food from even less ground. Some of this is old hat—there was a time when every farm in America fed itself this way. But cooking local is “a choice,” Wetzel said proudly, “kind of a challenge.” He takes old indigenous foods like seaweed and salmon roe and oven crisps them between sheets of aluminum foil, sculpted into waves, creating a salty abstraction of the sea. 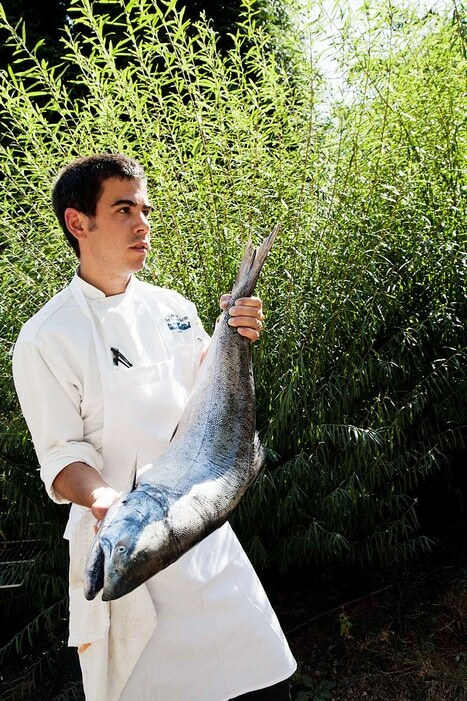 Chef Chris Weber of Washington State’s Herbfarm, with a king salmon he’ll serve. Wetzel was interrupted by a call, and returned later carrying a wooden box holding a salty boule of bread and some creamy Lummi Island butter. It was the island’s fishing cooperative calling. “They got five thousand,” he said, referring to sockeye salmon, which run through the islands in the late summer, headed toward the Fraser River in British Columbia. That solved the mystery of the seal out in the water: He was feasting on sockeye. I ate an embarrassing amount of the bread. On an island, you graze right up to the limit. The central idea of agritourism is that we all live on that island. Agritourism was invented in Italy—a way of visiting the traditional and eccentric corners of the Italian palate. Sustaining souls and artisanal food producers alike, agritourism has now spread far and wide. There are too many agritourism operations for Italy to count; France has 5,000, England 7,200. In the entire United States, there may be fewer than 1,000. Maybe it’s the name. The word agritourism sounds more like agribusiness, or aggravation, than what it is, which is travel to the things that feed us. Michael Pollan has urged eaters to “shake the hand that feeds you,” which seems to call for getting in the car and going to farms. Like wine long ago, foods have acquired the terroir of place and meaning. “There’s a story behind our food,” Josh Virtel, former president of Slow Food USA, told me one rainy night in Portland, “and we’re obsessed with it.” According to Virtel, in the United States agritourism is “bubbling up” any place where “rich farmland is close to a city, and the farmers are growing real food, not corn and soybeans.” It happens in New York’s Hudson River Valley and outside Atlanta, and it’s particularly widespread in the Pacific Northwest. Within minutes of driving off the Lummi Island ferry and onto the mainland, I was turning south onto Interstate 5, the north-south superhighway that bisects the region, to explore an emerging trail of agritourism operations. It takes hungry food pilgrims to Seattle, the city that revived coffee and so much else in the American palate, and then Portland, the current seat of America’s collective id when it comes to eating. It carries you from farm dinners in the Cascade Mountains to cheese makers who put you up in vintage Airstreams in Ashland, all the way down to northern California’s Mendocino. It is this swath of America that has volunteered to serve as our laboratory for adapting agritourism from European models, and helping to rescue the American family farm. 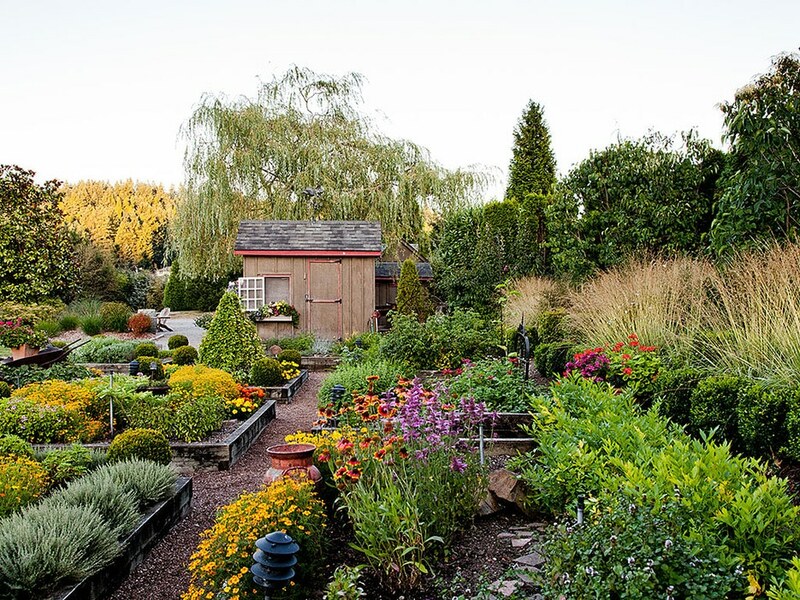 The Herbfarm’s model garden of raised beds supplies ingredients for the restaurant’s dishes. Peter Frank Edwards captures the most bucolic farms and farmstays of the Pacific Northwest in this gallery of photos and digital extras. Tonight the Herbfarm was offering its most popular menu of the year, the Hundred-Mile Dinner. Chef Chris Weber sources the entire nine-course meal entirely from the fields and waters within that radius, and as a test of sustainable, low-carbon deliciousness, the “challenge” was being waged with a rigor beyond what I’d seen even on Lummi Island: Every ingredient on the menu is checked with a GPS unit. For our starter, Van Dyck led a tour of the namesake herb garden, a small set of raised beds with views of vineyards. Fortified by sage-infused cocktails, about thirty-five diners followed her slowly, talking, rubbing, smelling, and masticating our way through aromatic appetizers: lemon thyme, scented geranium, bronze fennel, and three basils. Van Dyck tossed sprigs into the air like bouquet bombs. I’d already eaten nasturtium flowers for breakfast; here were their seeds, tasting like wasabi nuts. Inside, settled in among a hundred guests, Zimmerman introduced his staff and then evoked a foodie apocalypse. “What if the rest of the world vanished?” he asked us. “What would be the flavors of a cuisine of the Salish Sea?” That’s the old, tribal name for Puget Sound, the long slick of bays, islands, and channels that unites and defines the region. For Weber, defining that cuisine meant wrestling with some tough restrictions. No black pepper. No olive oil or vanilla or saffron. “Not a molecule,” Zimmerman said in the barnlike dining room with rustic beams and chintz curtains. Oregon wines were out of reach, as were the majority of Washington wines, grown far to the east in Walla Walla and other sunny parts. But there would be five genuinely local Washington wines, plus one from Canada. That producer, Averill Creek, is on Vancouver Island, but the south-facing valley where its pinot noir grows is bisected by the hundred-mile circle. Zimmerman did not try to separate the southern molecules from the northern ones, and ruled the resulting bottles in. The courses included summer berry soup, seared foie gras with hazelnuts, sorrel salsa verde, squash blossoms from the garden stuffed with what the menu called ten-mile lamb (“Actually, it’s three-mile lamb,” Zimmerman said). The cuisine was rooted, consistent, an entertainment, and also contained one of my favorite ingredients: failure. Amid the successes—the lamb tied for the best I’ve ever had, and I was once a shepherd in New Zealand—we puzzled over the five-grain bread, rich but dull. It sat, studied but uneaten, as unloved as the chicory “coffee” that ended the meal. What did get eaten: sockeye salmon, blazing red. It was as fresh as fish gets, having arrived from Lummi that very day. Placed down in front of me was a fillet taken from one of those five thousand fish that Blaine Wetzel had mentioned. It was baked lightly, without losing its aortal coloring, and flaked out into briny slabs, sea perfect, that would have pleased the Salish peoples as much as it did me. I didn’t have the heart to mention my odometer. Out in the parking lot, it read 103. I was hungry, so I ruled the salmon inbounds, and closed the distance to zero. My cup of coffee was held hostage. I was running late on my way to Portland, and pulled off Interstate 5 in southern Washington State, looking for a jolt of caffeine wherever I could find it. It was at exit 49: Lacey Rha’s Cafe in downtown Castle Rock. I paid, but the woman helping me just stood there, holding the coffee cup in her hand, out of my reach. “A couple of young guys from a valley near here roast the beans over a wood fire,” she volunteered. “Wood only,” she added, when I said nothing. No Go on the To Go. I could tell I was getting close to Portland, because we were talking about food and drink more than consuming it. Known for its kite-boarding, the bucolic Hood River Valley, east of Portland, is becoming an agritourism destination. She handed over my coffee. But like an enchantress, she had cast a spell on the cup. On the drive south, the last hour into Oregon, I kept musing on those two boys up in their wet Pacific Northwest valley. They were probably bearded and tattooed. I could see them filling the valley with smoke on dripping winter days. The coffee was actually good, which only deepened the spell. Was that a light note of smoldering fir in the aftertaste? People will believe anything about wine. Why not drink in the story behind the coffee—two kids improving the world, one bean at a time? A caffeinated hour later, I swept onto the I-5 bridge and looked over the little river city that has captured the imagination of food-obsessed Americans. Circumstances conspired here against bland and industrial eating. Eighty thousand salmon swim through downtown every fall—how could it not be a food city? It is also one of the youngest cities in America, demographically, crowded with Generation Food, the snout-to-tail eaters in their twenties and thirties who went home from a restaurant one night vowing to make goat cheese for the rest of their lives. Portland has reached a critical mass of these discerning and idealistic eaters, enough to keep a dizzying array of innovative restaurants in business, and the city has more food carts than garbage trucks. Much of the agritourism boom in the Pacific Northwest has been driven by these upscale urban diners, people from Seattle and Portland demanding something more than the usual restaurant experience. They don’t have to go far to find agriculture. 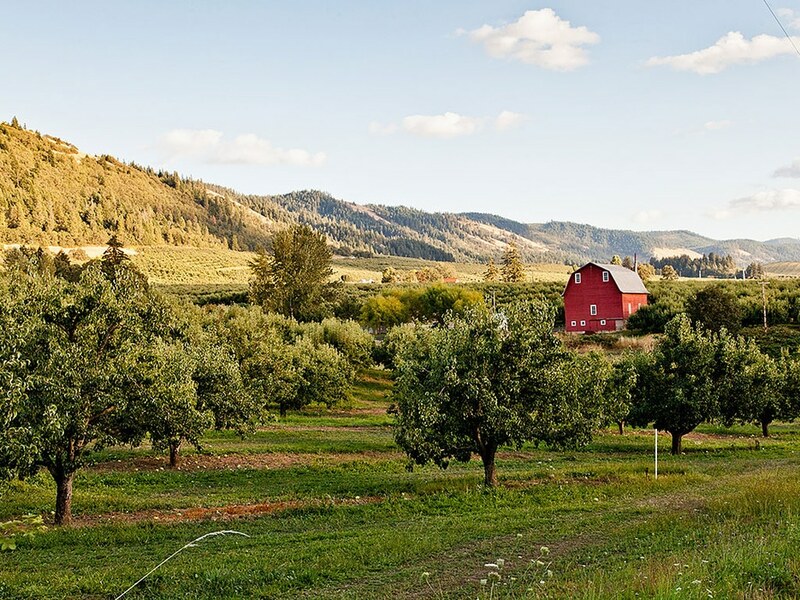 Thanks to open-space legislation dating to 1963, Portland is belted with small farms and orchards on land that would be strip malls anywhere else. To reach Intel, the world’s largest manufacturer of computer chips, you have to drive through amber fields of grain. And the rest of Oregon is an agritourist’s paradise: the wet west carved into small family farms during pioneer days, the east a realm of sunny high plains suited to cattle. Obsessive food culture isn’t eccentric or marginal in Portland: Local politicians have courted a powerful demographic known as “the chicken people,” and hipsters in florid beards relax by hacking up small animals during classes at the Portland Meat Collective. This last group—a cooperative that provides fresh, local meat for its members—was recently the subject of what passes for serious crime in Portland. The short version of the tale: The night before a Meat Collective class on dressing and cooking a rabbit, someone “liberated” the eighteen bunnies designated for slaughter. The fugitive rabbits were soon found in the hands of a rescue group, called Rabbit Advocates. Police were called. Lawyers were called. The clash of microcultures erupted in online forums with an unusual degree of literacy. And it ended, Portland-style, through acts of competitive abnegation. Rabbit Advocates agreed to return the bunnies, under protest. The Portland Meat Collective issued a nice statement acknowledging their protest. But then a Portland Police Bureau detective counted only seventeen rabbits. The missing bunny—actual name Roger Rabbit—was traced to the house of a local woman, who offered fifteen hundred dollars if she could keep him. The carnivores declined, on principle. But when the eighteenth rabbit was finally returned, the Meat Collective then gifted seventeen of them back to Rabbit Advocates. Roger Rabbit was returned to his lady friend, who donated her fifteen hundred dollars to charities in Haiti. If you can follow that, welcome to Portland. Like any sane person, my reaction was to sign up for a class at the Meat Collective. Enrollment had doubled after news about the ’napping, and classes in rabbit butchery and attacking beef carcasses with a cleaver were completely booked. So I arrived in downtown Portland on a bright Saturday morning to learn the art and science of breaking down a duck, “from breast to rillarde,” as the instructor, Seattle butcher Sarah Wong, declared. Within minutes, fourteen students were opening bone seams with our fingernails. All of my busy, focused classmates were amateurs, but they tossed around terms like frenching and the one-year pig, and asked me wary questions about my level of commitment (“Patrick, are you a food person?”). These Portlanders actually knew the names of their farmers (“Loretta,” a woman told me. “She’s great”). At Farm to Fork‘s farm dinners in Oregon, they serve dishes like this salad of watermelon, baby beets, mint, and ricotta. Being an agritourist will take you to an assortment of restaurants, farms and farm stays, wineries, inns, and food producers. Farm to table once just meant bringing local food to the restaurant table. Then the traffic reversed, rabbit hutches appearing in the city. Now the line between urban and rural is blurring. Half of what has been happening across the Pacific Northwest is an education, the creation of a class of upskilled consumers, ready to connect with farms in that renewed American way. Nobody in Europe needed agritourism to teach them where a duck came from, or the story behind a cup of coffee; European agritourism grew out of a base of localized food and knowledge. In America that has to be created, and agritourism is often about raising not the next harvest of lambs but the next generation of farmers and foodies. I was out of my depth. But I left after two hours converted to a new gospel of domestic food production, of urban agritourism. What had seemed like an impossible task best left to some distant ranch—turning an animal into food—was now something I could do with my own hands. I have a coffee-rubbed duck breast hanging in my basement right now, dripping fat and flaunting the health codes. What Portland proved to me was that a city could nurture appetites that in turn renew the rural areas close around it. Such transformations have been saving and reviving places like the Hood River Valley, an hour east of Portland in the Cascade Mountains. In the 1960s and ’70s, the valley was in decline, a hard-luck hollow of family farms on the verge of failure. Today Hood River Valley has a pleasant mixture of agriculture and tourism, where IPO-funded micro-wineries sit next to corn mazes, and big commercial orchards exist beside small lots marked with cardboard signs reading strawberries u-pick $4. Sakura Ridge, a farmhouse inn, has luxury bedding amid bleating lambs and a forty-acre cherry orchard. And up at the head of the valley lies Kiyokawa Family Farms, a place run by the same Japanese-American clan for four generations. The Kiyokawas have carefully shepherded some eighty obscure cultivars of apples and pears through the great consolidation of crops during the twentieth century. They’ve gone bust only once in the process, which is some kind of record in farming, and now people like me not only show up to buy their obscure fruit but actually go out and pick it ourselves. For his next dinner, I drove up to Bend, at 3,600 feet in Oregon’s central Cascade Range, where 165 people—a mixture of locals and visitors from across the state—had gathered at the Fields Farm. Our dining room was made of brown dirt, fringed with green rows of sweet onion on one side and leeks on the other, the space canopied by a blue sky and a low-hanging sun. There were houses wrapped around the ten-acre farm, including empty subdivisions left behind in the real estate bust. Agritourism depends on the closeness of the city to farms, but that threatens farms as well. The lamb? It was butchered an hour north, in arid little Maupin. The cornmeal was from Bob’s Red Mill, an award-winning grinder in Milwaukie, Oregon. Pickled apple slices from the Kiyokawa orchard were head-clearingly tart. The nettles…I wasn’t even sure what nettles were, but they were gathered literally down the road, taken in bunches from a fence-line bramble. Dodson was right about the beef—buttery smooth with a savory umami profile. The beet greens set some sort of record for localness. Grown about a hundred feet to the west of our table, they’d never known a roof or a truck. The only way to get more local would have been to graze the rows of kohlrabi on our hands and knees. I’m guessing someone will do that next year. Mud to Molar, maybe? One example of the Herbfarm’s produce: Angelo Pellegrini beans. Moving south again on I-5, I climbed slowly up the Willamette Valley, Oregon’s wine country. Vineyards set the pattern long ago for agritourism, fostering a go-to-the-source mentality among customers seeking an indefinable terroir. Yet when vineyards and other producers have tried to embrace commercial agritourism, they’ve often run into resistance. Some Oregon counties restrict the number of domiciles a farm can have, blocking them from opening guesthouses. And a chef in Walla Walla, Washington, corrected me when I called about his restaurant, said to be the best in that farming community. He didn’t have a restaurant, he told me; thanks to zoning laws, he had a “private supper club,” serving by reservation only. But they don’t do lodging—no food-wine-bedding interplay. European agritourism is rooted in farm stays. In Oregon, as in much of the United States, long-ago food scares at farm stands and dairies led to a ban on farm restaurants and to other restrictions. Farms must navigate a narrow path of exceptions for bed-and-breakfasts and catering licenses. I spent the night at one of the emblematic champions of this tricky course, a farm in western Oregon known as the Leaping Lamb, in Alsea. 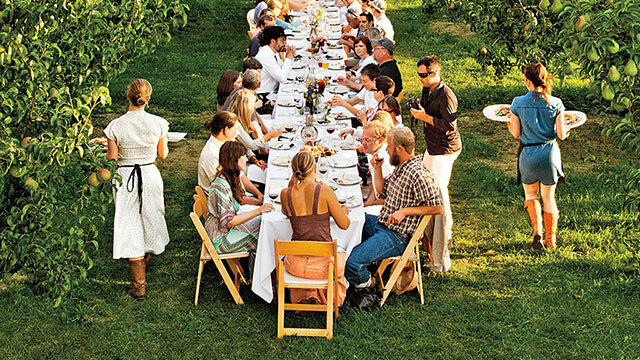 The owner, Scottie Jones, has become a leading proponent of agritourism, which she calls “a loose term—it can be anything from a pumpkin patch and corn maze to having people stay on your farm or ranch.” Glamorous farm dinners count; so does taking a cheese class at Quillasascut Farm in Washington State. For the Web site farmstayus.com, which connects travelers with agritourism opportunities, Jones counted about 970 ranches, farms, or vineyards in the United States that qualified as some form of agritourism. I got back to the land in all the wrong ways. On a tour at Leaping Lamb, I scratched myself on a thicket of sharp weeds and finally learned what nettles are. I’d been served nettles more than once—best of all, pureed into a sauce for sea bass at the appropriately named Thistle restaurant in McMinnville. Now my elbow was blossoming into a furious itch. “You take ’em when they’re young,” advised Emery Jones, Scottie’s twenty-six-year-old daughter, who was showing me around. She recommended gloves. Farm dinners organized by Farm to Fork are not expensive—less than $100 per person—and you’re helping to support the farms involved. From my first Vancouver views, all the way down to northern California, I-5 wasn’t the only thing uniting my trip. Wherever I went there was a Willow—a confusing overlap of this common name, from Willows Inn on Lummi Island to the Willows Lodge beside the Herbfarm. And now, road-weary and food-satiated, I came to Willow-Witt Ranch, on the Oregon-California border, outside Ashland. Here was agritourism at its best: on a goat and pig farm in a soft Cascades valley. Brooke Willow showed me to my safari tent in a grassy meadow. There were two of these large tents on elevated platforms, which held soft beds and old steamer trunks. Nigerian dwarf goats bleated in the background, ready to produce the ranch’s award-winning cheese. Pigs—destined for the dining tables of Ashland—rooted around out in the woods. The ranch also has a small, polished cabin, making this one of the larger farm-stays I’d visited. “Everyone who has been to Europe wants the experience,” Willow said of agritourism. “There is absolutely a market for it.” She dreamed of opening a German restaurant in the lower meadow, topped with rooms for overnight guests. But “rules hold us back,” she told me. They’d needed a special variance to build the one cabin. The Serengeti-style tents are considered campground facilities and are easier to permit. Farm life is hedged in by rules of all kinds, she said. Raw milk, cheese, and meat are regulated like weapons of mass destruction. The farm is forced to process its “local” pork at a USDA facility three hours away, then drive it back to Ashland. “Everybody is making it up as they go along,” she said. The promise and peril of that statement—the innovation and difficulty it captures—stayed with me as I finally drove out of Oregon, the Pacific Northwest, and the new world of American agritourism. I had grown to love everything about agritourism, except perhaps the name. Maybe it sounds better when pronounced in the original Italian, agriturismo, with a bit of sprezzatura. But only at the end of my rambles did I remember that we already have a name for this. As far back as the 1840s, a class of privileged people had started appearing on the coast of Maine in summer, renting farm cottages and praising the charms of rural life. They also wanted hot baths and soft beds, however, and Mainers came up with a dryly satiric moniker for them: rusticators. They were proto-agritourists, convinced of the moral power of reconnecting to the land and determined to have fun doing it. We might as well embrace the name, even if we modern rusticators are much more sophisticated. They thought fresh air would make them healthy. We know, of course, only expensive food can do that.